Warlords of Draenor brought a couple of changes to the professions. You no longer have to get trained to the next level of gathering/crafting skill. You’ll want to see your trainer for new recipes, but that’s it. At 90 you gain access to Warlords professions. If you have a level 1 skill in any profession you can level it to max without ever leaving Draenor. First Aid, Archeology, Engineering, etc. If you have a level 60, and have your professions at level one, then when you boost to 90 those professions will be at 600. As you quest in Draenor you will quickly find scrolls that will give you access to the Draenor level skills. The scrolls for crafts (Blacksmithing, etc.) will require a short quest. Scrolls for the secondary professions (1st aid, etc.) will simply give you access directly. Garrisons are a big help to the professions. In fact, you no longer need to have skinning, mining, or herbalism as you can gain decent quantities of all of those materials through your garrison. Having the skills will, however, let you farm/gather all that stuff that’s not in your garrison. Note that since few people are farming the old world it might be worth your while to raise your skill and head back there, where your gathered goods might well sell for a lot more than the Draenor goods. Followers in your garrison will allows you to get more of the basic materials and allows access to some interesting items. Profession Bonuses are dead in Warlords. No longer to you get extra slots from Blacksmithing, stamina from mining, and so on. They’re pretty much now all for gold making or equipping some useful items. Crafting professions can now make raid quality gear that can be equipping at level 91. Yes, you can have ilevel 685 armor pieces at 91, and it’ll be higher in patch 6.2. The only catch is that it’s very expensive to create and raise these items to that level. Our profession guides will show you how to get your professions to the level cap ASAP, along with some info on cool items you can create and how to make some gold with your skills. While most of the crafting professions are great gold makers, with any of them you should be able to at least make back your investment without too much work. All of the main professions have self-only enchants or items that are pretty nice, though the rest of the profession may not be appropriate, if you’re looking for gear. A Warrior has little reason to take Tailoring, for example, though there’s a cloak enchant which adds Attack Power. As noted above, the profession bonuses are now dead. If you’re just starting out and/or gold is an issue, then you might want to skip the crafting professions till you have enough gold to buy mats or the time (and the level) to farm them all. We can’t help with the time problem, but our gold guide can help with the cash flow. Note the the Draenor professions are much faster, cheaper, and easier to level than before. Alchemy – You will be able to create a large variety of useful potions that will heal, restore mana, slowly regenerate health, let you move faster or breathe underwater, and so on. Blacksmithing – You will be able to create all kinds of weapon and armor and there are some sweet spots where you can make some decent gold. Enchanting – One of the most expensive professions to level, but you can save a lot of gold by disenchanting items, perhaps from Tailoring, into parts that you can sell or use. Use this skill to add anhancements to most of your, or your friends’, gear and weapons. Engineering – Very expensive to level, but you will be able to create some nifty gadgets, including those motorcycles you see some people riding around in. 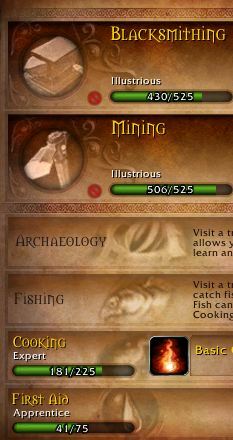 Mining is a compatible profession, since you will go through a lot of metal to level this skill. Inscription – Plays best with Herbalism. Not as grimly expensive to level as some of the others, but you will go through a lot of herbs. Create glyphs, cool magic items, and some enchants. It’s also a decent money maker. Jewelcrafting – You can be your own Tiffany Diamonds Company. Well, not quite, but you will be able to cut all kinds of interesting gems and make some nice jewelry. This skill plays well with Mining, since you will “prospect” the ore for your gems. Leatherworking – Plays best with skinning. There are a bazillion skinnable mobs in WoW, skin them all and you’ll have enough materials to level this profession cheaply. At the higher levels you can make mail armor as well as leather, so this skill is great for Rogues, Druids, Shamen, and Hunters. Tailoring – Save all that cloth that you’re collecting as you level up as you can use it to level your Tailoring skill. Mages, Priests, and Warlocks can create some nice armor and gear with this skill. Leveling Herbalism – Yes, you’re a flower picker. Here’s where to go and what to pick to get your skill up. Herbalism is a nice little gold maker, too. Leveling Skinning – Also a fine gold making skill. The skins can also be used in leatherworking and a couple of other skills. With a bazillion mobs to skin in the game you will never run out of skins to sell or use. Mining – Another good skill for earmning gold. Your ores are used by blacksmiths, engineers, Jewelcrafters, and sometimes others. Leveling First Aid – If you don’t cast your own heals then this is an essential skill. If you ever run out of mana at the end of a fight and need some healing then you might also want to take it anyway. Warlords 1st Aid levels fast and easy and youi can make some nice healing potions. You can also make bandages, but the potions are better. Leveling Cooking – You can cook up lots of interesting foods, some of which will buff various stats. These buffs stack with those of any of the above skills, as well as with other buffs. Fishing – Cast out a line and catch… weeds. If your skill is high enough for the area that you’re fishing then you will catch more fish than weeds. The fish can be used in cooking recipes and some can be used by Alchmists (eg: Oily Blackmouth.) Lures will increase your fishing skill for a few minutes. We do not have a fishing guide at this time. The fishing hut in your garrison will let you add +15 to your fishing skill every day, without over dropping a line into the water. Get the quest, visit the Auction House, buy the required items, hand ’em in, +15 skill. Leveling Archeology – Learn about the lore of the world and find strange new artifacts. You will occasionally find Arch. bits in your Garrison mine. Making gold with your professions: Take a close look at the Tycoon gold addon. This addon will draw gathering routes on your main and mini-maps, making gathering much easier, and will also show you the top gear selling on the Auction house. It’s a killer addon which will make you a lot more gold. Here’s our tycoon addon review.